The hottest on the eart planet! The origins of this chili are to be found in Central America and specifically in the district of the state of Moruga Trinidad and Tobago (Caribbean Islands).Probably it is a cross between a simple Trinidad Scorpion and some other varieties always extremely spicy. 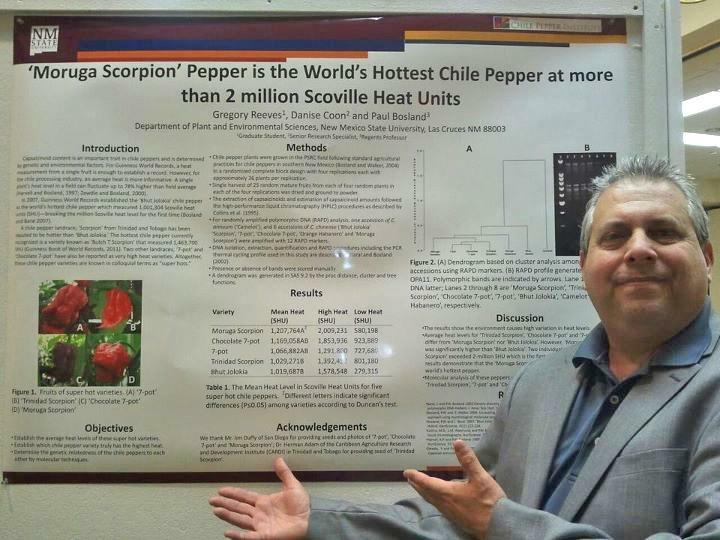 In February 2012, the Chile Pepper Institute at the University of New Mexico, made some controls, with a mass gas chromatograph, to mesure the amount of capsaicin in some peppers object of study. Then, by a mathematical formula, they obtained the degrades Scoville that indicate the level of pungency. The chili Trinidad Moruga Scorpion reached a maximum value of 2,009,231 Scoville degrees. That is currently the highest value ever achieved by a chili, but it is correct to point out that the average value was 1,207,764 as you can see from the picture. 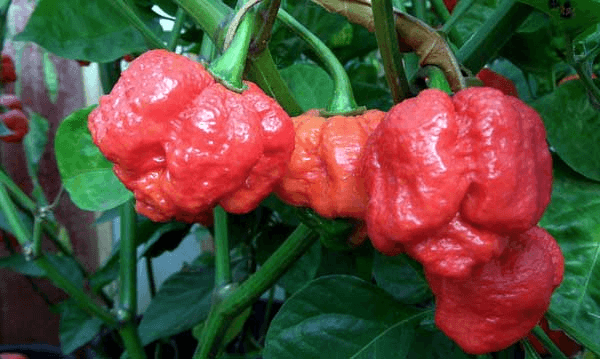 Like all other world champions too the Moruga Scorpion belongs to the species Capsicum Chinense and has a sweet and fruity fragrance that contrasts with its dangerous spicy. When you taste a bit 'of Trinidad Moruga Scorpion, thanks to its sweet fruity taste, the initial effect of its is nice but the feelings will change little by little until you get to a burning unstoppable and, above all, impossible to bear. We do not think it was included in the Guinness Book World Record, at least until 2012. Probably because it is still considered a hybrid and its characteristics are not stable. The cultivation of Moruga Scorpion at La Casetta is began in February 2013, We started with different seeds, guaranteed to be original, but they come from England and the United States. This also to check and compare the existing varieties of them. We requested the italian derogation for organic cultivation and careful we start the selection to de-hybridize the variety and make it stable. 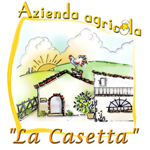 The first harvest is expected for August 2013!